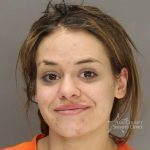 Deputies arrested a Boise duo for drug trafficking after finding eight large packages of methamphetamine in their SUV Saturday morning. James L. Dorsey and Brandy C. Grenicko are charged with felony counts of trafficking methamphetamine. The 59-year-old Dorsey and 41-year-old Grenicko are being held in the Ada County Jail and are set to make their initial court appearances Tuesday afternoon. Deputies pulled over a black Nissan Pathfinder for speeding on the westbound lanes of Interstate 84 near the Blacks Creek Road exit just after 10 a.m. Saturday. The Nissan was recorded going 90 mph and failed to stay in the lane of travel before deputies pulled it over. It was during the traffic stop when deputies determined Grenicko was on parole for a conviction for possession of controlled substance with intent to deliver from 2012. The deputy who pulled the SUV over is a K9 officer, so he got the dog out to sniff around the car. K9 dog Hondo detected drugs at two different places in the SUV. Deputies found eight large packages of methamphetamine inside a backpack in the back of the SUV, several meth pipes in the front, and a loaded handgun inside a suitcase. Deputies arrested Dorsey and Grenicko and booked them into the Ada County Jail.